Olivier Merlo works for a dangerous man. He does what he’s told without asking questions because he needs to protect his sister and niece. When someone gives his boss trouble, Olivier does what he does best. It’s a routine hit—until the victim’s brother starts poking around. Cody Anders left his family behind a decade ago—along with their wealth and influence—to live on his own terms. Still, he knows his twin didn’t die of a drug overdose, and he’ll do anything to find the truth. What he uncovers is a conspiracy that will topple his family and leave him staring down the barrel of a gun. Olivier must decide if he’s going to obey orders or free himself from the curse that has guided his hand for centuries. Cody, who challenges Olivier’s notion that no one can love him, holds the key to breaking his chains. But when the truth finally comes out, it might be more than Cody can accept. 'Olivier' is book #7 in the series 'Order of the Black Knights' and it's by T. J. Nichols. I'm really enjoying this series so far and while I haven't had the chance to read all of the books I've liked the ones that I have read and have hopes of going back to read the one's that I've had to miss. 'The Order of the Black Knights is very much a series that allows for the books to be read as standalones. There is one character that is a constant in each book and while he is the thread that ties the stories together each story gives a more than sufficient explanation of his connection. Olivier works for organized crime. Essentially he's a hitman who refers to himself as a problem solver. But for as simple as this might look...appearances can be deceiving. Becoming a hitman was never his goal or ambition for him it was more about circumstances and circumstances are that he has a sister and a niece whom he loves dearly and will protect at any cost and if that cost is doing what he's told to without asking questions...he'll do it. He's never questioned this or really thought about it. Guilt and fear are foreign concepts for him until the day he meets the twin brother of his latest victim. Suddenly he's having dreams about the past...about lives long gone, where history seems to repeat itself over and over again and he's finding that he seems to care about more than the well being of just his sister and niece, but still putting them at risk isn't an option. Cody walked away from his family fifteen years ago when his father rejected them and he's never looked back. All it takes to disrupt his well ordered life is an e-mail from his twin brother's wife telling him that his brothers dead. The coroner says 'overdose' but his sister-in-law says murder. Cody wants answers and without really giving things a second thought Cody heads back to New York a place he swore never to go back to. While 'Olivier' didn't work as well for me as 'Gideon' or 'Jaeger' there was still a lot about this story that I really liked. While the attraction between Olivier and Cody was strong. Initially it felt more like a physical thing and the subsequent emotional connection came as they spent time together and the story progressed. I also liked the conflict that was essentially always there as a result of Cody and Olivier's objectives being at odds with each other. While I liked the ending it also felt a little too abrupt for me and while 'Gideon' and 'Jaeger' felt like they ended with an HEA this one felt like we were being left with an HFN, with strong potential but still not the HEA that these two men really deserved. 'The Order of the Black Knight' is not a romance series...these stories have a strong mystical element to them and they are definitely second chance stories about finding and giving forgiveness, seeking redemption and ultimately finding love. 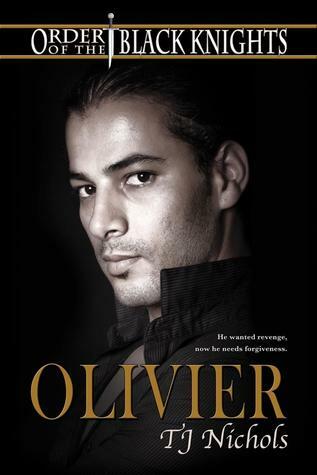 An ARC of 'Olivier' was graciously provided by the publisher in exchange for an honest review. Buylinks are provided as a courtesy and do not constitute and endorsement of or affiliation with this book, author or booksellers listed.